Some tree houses are crafted in organic shapes and materials to blend into their environments or designed as veritable castles in the sky, but these 14 are as modern as arboreal dwellings get. 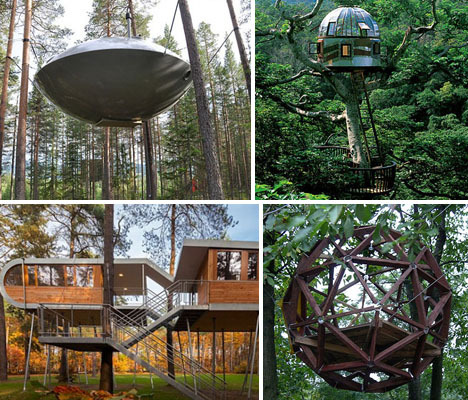 Ranging from a tree hotel in Sweden with a variety of eye-popping options to a simple freestanding backyard structure you can build yourself, these contemporary tree houses might get you daydreaming about your own private tree retreat. 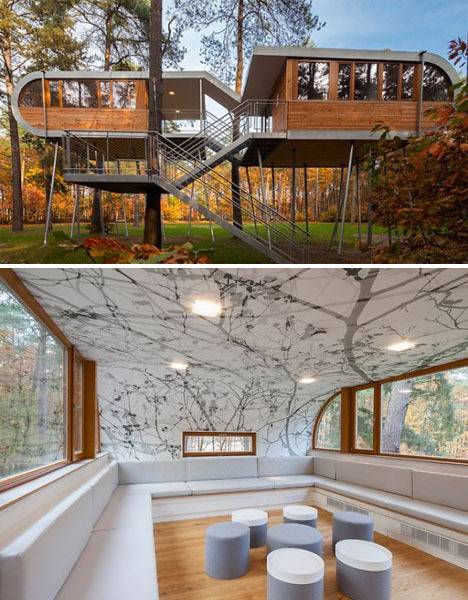 Your brainpower might just be multiplied if you attended a work conference in a treehouse like this one. The stimulating environment of a Belgian forest provides the setting for an elevated structure consisting of two large wooden cabins connected by a walkway, with a ramp leading to the grass below. Built by German architectural studio Baumraum, which is responsible for many other gorgeous modern tree houses, this complex is set on 19 stilts. Inspired by serpents, these twin treehouses in Pedras Salgadas Park, Portugal take advantage of a sloping hillside. 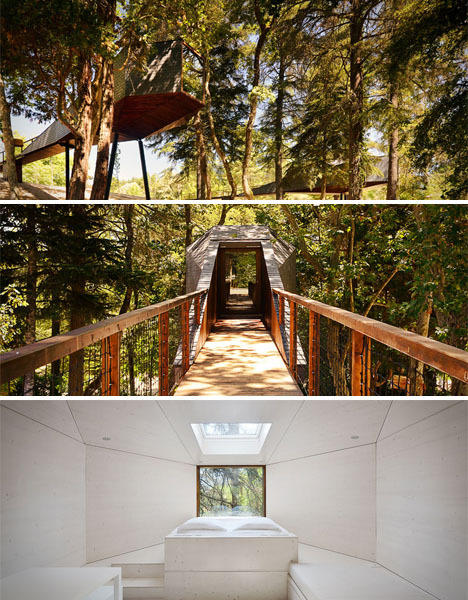 The structures extend out from ground level to hover within the woods, requiring no stairs or ladders to feel as if you’ve ascended into the treetops. Each unit is equipped with a mater bedroom studio space with a small kitchen and wash area. Set it on the ground or put it in the trees – ‘Eco Perch’ by Blue Forest is adaptable to virtually any environment you’d like to place it in. 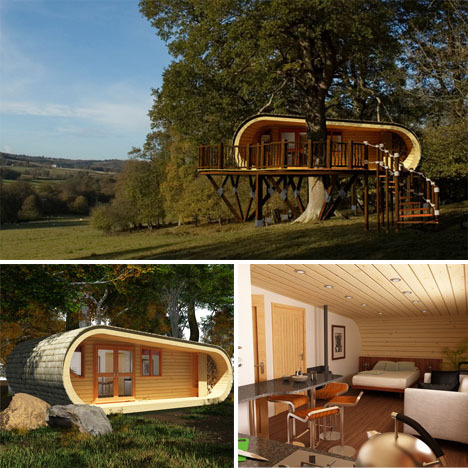 The prefab luxury tree house unit is made of natural materials and can be installed within 5 days, taking up just 6 by 8 meters. The living area, kitchen and bedroom inside can accommodate up to four people. Those of us who were lucky enough to have a treehouse as kids often happily made do with little more than a rickety plywood platform and ladder treads nailed into the bark. 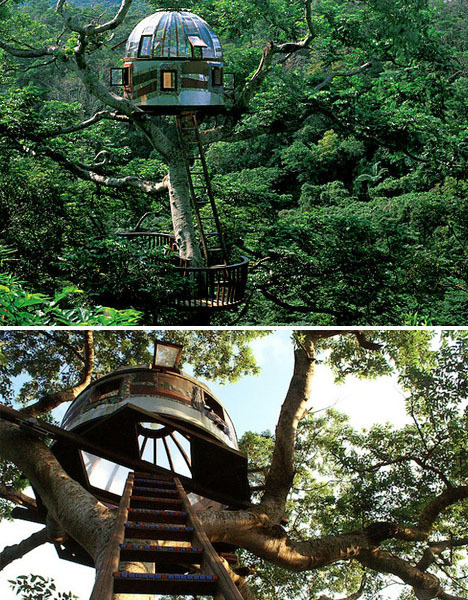 How fun would it have been to call a two-story treehouse like this one your very own? 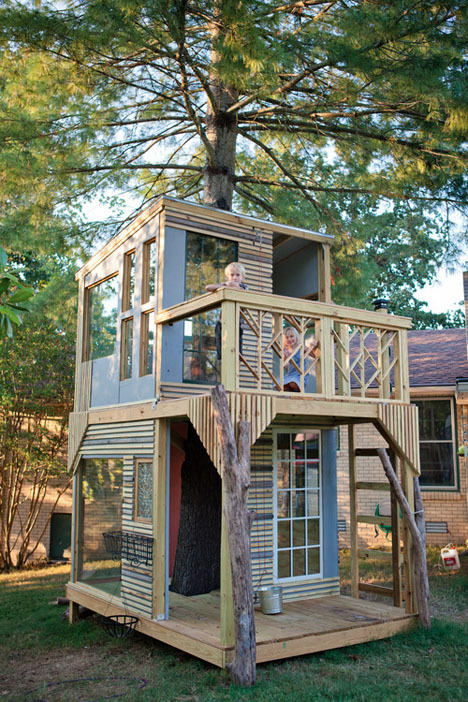 This freestanding treehouse was built around a pine in the owner’s Nashville backyard.